President Barack Obama has ordered an additional 450 U.S. troops be deployed to Iraq, but insisted that they will not engage in battle with terror group ISIS. The U.S. has 3,050 forces stationed in the country, but they are focused on training Sunni militias and providing other types of support. "To improve the capabilities and effectiveness of partners on the ground, the president authorized the deployment of up to 450 additional U.S. military personnel to train, advise and assist Iraqi Security Forces," the White House said in a statement on Wednesday. Elissa Slotkin, the principal deputy assistant secretary of Defense for International Security Affairs, added: "These forces, again, will provide an advisory, training, and support role. They are not conducting offensive ground combat operations." The U.S. and a broad coalition of international allies have been hitting ISIS with airstrikes across Iraq and Syria since the summer of 2014, attempting to push back the jihadists who have captured significant territory in the region. Obama has maintained throughout the initiative that the U.S. will not engage in ground combat with the Islamic militants, but instead arm and train local forces who are trying to protect or liberate cities from ISIS' control. Ben Rhodes, the deputy national security advisor for Strategic Communications, added in the same press conference that Obama's hopes are that "local solutions" will be enough to take back the territory captured by ISIS, and wants Iraqis to take the lead in the initiative. "The president has focused in the options that he has chosen on those elements that will better enable Iraqi capacity, both in terms of the types of equipment we're able to expedite to them, but also in terms of our ability to provide training and advice, intelligence support, support with command and control, so that they can ultimately be the ones on the front lines who are working to take back their own territories," Rhodes said. The American government has followed a similar strategy in Syria, and has sought to expand its forces in the war-torn country in the past few months. 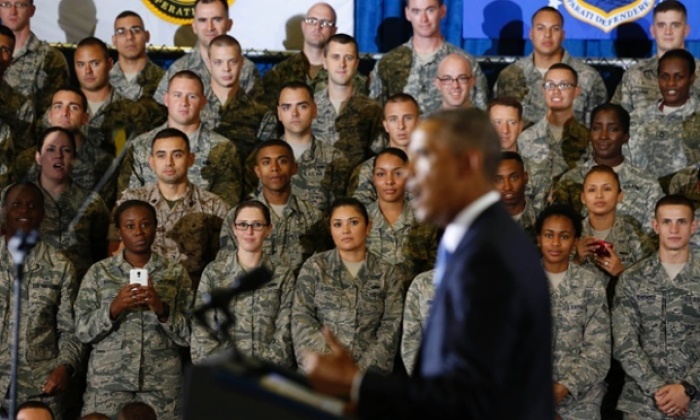 Back in January, Obama said that 400 troops will be deployed later in the year as part of a three-year mission to train and equip rebel forces that are fighting ISIS both in Syria and Iraq. Earlier this week at the G7 conference in Germany, Obama admitted, however, that he does not have a "complete strategy" yet to defeat the terror group. "We don't yet have a complete strategy because it requires commitments on the part of the Iraqis," Obama said. Saleem al-Jubouri, the speaker of the Iraqi parliament and the country's highest-ranking Sunni politician, has said that military operations, however successful, will not be enough to end radicalization in the region. Jubouri argued before the Institute of Peace in Washington D.C. on Monday that a "new democracy" must be "built in the minds of people" in order to prevent new forms of oppression from rising up. "How can we create an equal situation? We know anybody who caries weapons has the ability to impose his will on others," the Iraqi parliament speaker said. "So I call for the international community to focus on a project for stability after the liberation of the areas from Daesh [ISIS]. This project ... is to achieve stability and to build a new democracy within the minds of people."